Today marks a first for my blog and I am so excited to introduce my very first Guest Blogger! Kelli Stewart is a great friend and neighbour. 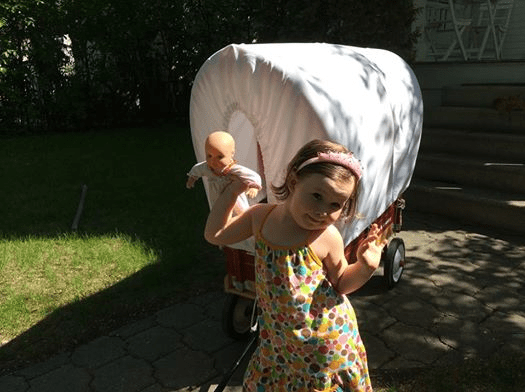 Her idea for a DIY covered wagon is simply genius and she offered to share the steps with us. To find out how to make your own covered wagon to protect your little one from the sun…..check out her post! My prairie princess and her new covered wagon. I made our Town and Country Radio Flyer into a covered wagon for $10! It’s great for keeping the sun off of little passengers and it’s a lot of fun– a play fort on wheels! Detachable covered wagon kits can be anywhere from $70 to $230, so before you hand over a wagon full of money, think about making one yourself! Cut the bamboo sticks down to 2 feet (cut off the pointed side). Lash them to the three side supports on either side of the wagon with the cotton clothesline cord (use a foot). If the bamboo stick fits into the metal supports, push them in to further secure the sticks. These bamboo sticks are the side supports for the pool noodle arches. This is a way to lash the bamboo stick, so busy little hands can’t untie your supports while they’re on their wagon ride. They likely won’t even notice it, from the inside! Find half way on your pool noodle, mark it with a line. This is where you will attach the wooden dowel to the pool noodle later. Make an arch with the noodle and put it on the bamboo supports. The bamboo sticks go into the holes at each end of the noodle (it’s easiest to put both sides on at the same time). The dowel should be about 6 inches longer than the wagon. This makes the arches slightly splayed at the end. This extra bit of tension gives the whole thing more support. Find the half way on the dowel and mark it with a line. This is where you will attach the center pool noodle to the wooden dowel. 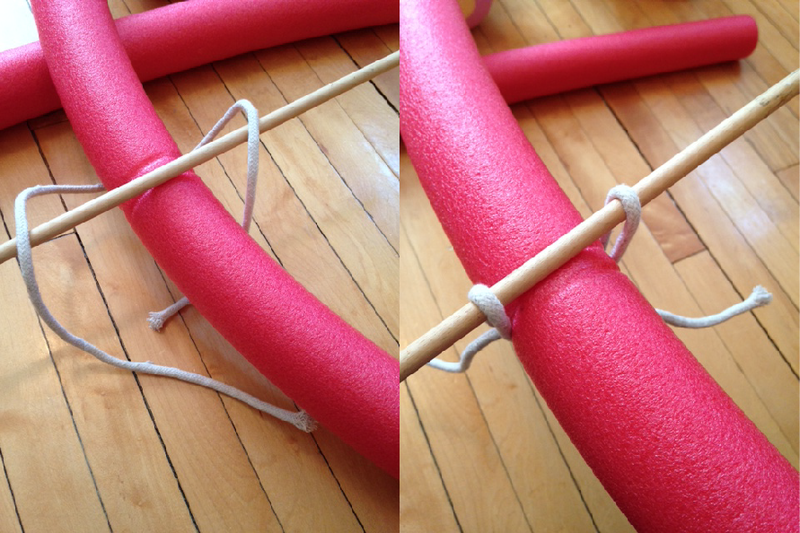 Use a foot to a foot and a half of the cotton clothesline cord to lash the pool noodle arches to the dowel, attaching the centre arch first and then at either end (line the halfway line on the noodle with the dowel). Make sure the end arches are in about the same distance away from either end. My husband said that I lash things like a sailor… better than swearing I guess! Here’s how I lashed dowel support to the noodle arches. To secure the wooden dowel to the arches, put the cord under the noodle perpendicularly, put the dowel on top of the noodle, put the ends of the cord up and over the dowel then tie the cord ends underneath the noodle. It should be secure enough without a knot to make any adjustments to get the two ends even. When they’re even, tie your knot. Yay! You’re halfway done! By this point, you should have what looks like the bones of a covered wagon. Now for the skin! Get a sewing measuring tape. Measure the bended pool noodle arch (ours was 2 inches longer than when it wasn’t bended into an arch). Add 3 inches for the draw string hem. This is measurement A. Measure the length and width of the wagon. Add 3 inches for the draw string hem. This is measurement B. Cut out the sheet AxB. At the corners, iron a diagonal corner (see below photo with instructions). 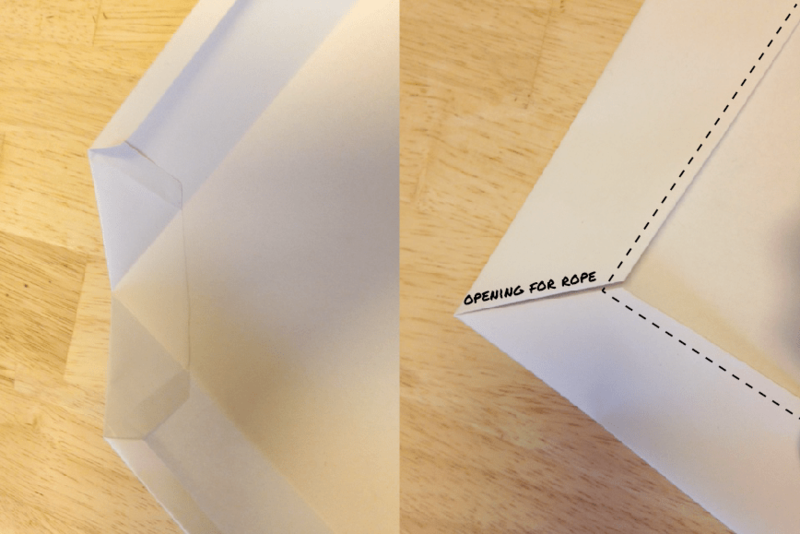 Both horizontal and vertical drawstring cord will come out of this opening. Cut off the corner tip diagonally from the first 0.25 fold. Where the two iron lines meet in the corner at the 1.25 fold, press your material down at a diagonal. Fold both hems in and press. Remember to leave the diagonal open. This is where you thread your cord in and out of! Put the sheet on the arches (A measurement runs parallel with the arches). Cut a piece of cord from the clothesline the length of measurement A+B x 2. This will be more than enough, but better more than less! To thread the cord through, I used an giant safety pin that only grandmas seem to have (I inherited mine from a good family friend) to help the job go quicker. Thread the cord down the right side: front to back, then thread the cord loop de loop: up the left side of the end hem to the right side of the end hem, to the left side of the wagon (back to front), to the end hem of the right side out the left side of the end hem, and tie it to the remaining cord hanging out the right side where you first entered. (If I was to do this again, I would likely loop both ends of the cord through the end hem, just to make opening and shutting the entrance a little more manageable, but you certainly don’t have to). Adjust your fabric so it lays nice and even on the arches, and you’re done! Put a kid in there! Have some fun in your new covered wagon! The great thing is that it’s easy to take off, too, so it’s not a permanent decision. I pulled the cover and the noodles off all at once and my daughter used it as a tent in our living room… might as well make the most of those $10! Posted on June 23, 2014 by Kelli Stewart •	This entry was posted in DIY and Upcycling and tagged cowboy birthday party prop, cowboy birthday wagon, DIY covered wagon, how to make a covered wagon, how to make a shade for your wagon, protecting your kids from the sun. Bookmark the permalink. ← What’s a New Moon Party? I would have given a great deal to have had this as a kid. I was always wanting to run away with the gypsies. travelling in a covered wagon, This is really brilliant. How cute & what a good idea. We did the same thing for our dog wagon, but we used hoola hoops from the $ store, just cut them in half.